One neighbor said he was taking video and caught two jumping in the air, synchronized, as if they were escapees from Sea World. (We once watched a dolphin we named Flipper who was following us while we were sailing in the ocean and did a flip in the air.) 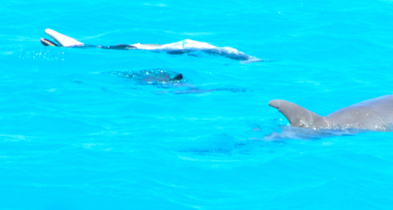 When you watch the antics of dolphins in the wild, you wonder who is training who at Sea World and other water parks. 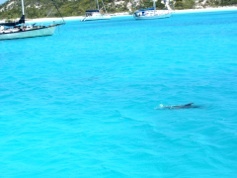 Some cruisers jumped in the water with their snorkels and swam with the dolphins, who seemed to enjoy the company. It’s odd. 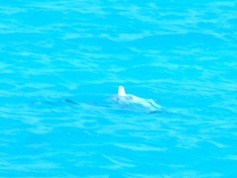 No matter how often we see these graceful sea creatures, we always stop what we are doing and watch them in awe. They never fail to put a smile on everyone’s faces.